Over time, heat and pressure squeezed those rocks until water began oozing up to the planet's surface, pooling there. That would mean our oceans were basically the result of rocks in the planet's mantle being wrung out like sponges. Mineral physicist Steve Jacobsen and his team wanted to find out if this was really happening. To figure it out, they placed a water-retaining rock called ringwoodite — found commonly in the mantle — in a machine that could create the high temperatures and pressures found 400-600 km below the Earth's surface. Under those conditions, water actually dehydrates. That means the water goes from being H2o to oH — it loses one of its hydrogen atoms, and becomes hydroxyl. But it still oozes out of the rock, and eventually becomes water again as it journeys to the surface, grabbing a handy hydrogen atom en route. So they knew it was technically possible for rocks in the mantle to be releasing water to the surface. The question is, do we have any evidence that ringwoodite has been sweating out a bunch of water down there? In search of answers, the group looked at data from earthquakes, which send seismic waves through the Earth's core. Those waves are relatively easy to track with seismographs, and we know that they slow down when they encounter water. We've also know for a while that they mysteriously slow down at about 600 km below the Earth's surface. After some analysis, Jacobsen and his team found that seismic records suggested that the mantle did hold what appeared to dehydrated water, probably squeezed from ringwoodite. So, not like this, then. What would this underground "ocean" look like? It wouldn't be a giant lake, like in Journey to the Center of the Earth or The Core. Instead, it would probably look like a lot of sweaty, semi-liquid rocks, oozing dehydrated water from tiny pores between each grain. Some of that water is probably still slowly seeping up to the surface, feeding our oceans. 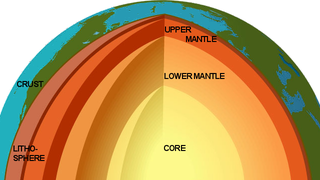 If true, this research means that a lot of Earth's water is below our feet, wrapping the core of our planet. "We should be grateful for this deep reservoir," Jacobsen told New Scientist. "If it wasn't there, it would be on the surface of the Earth, and mountain tops would be the only land poking out."